Period of creation 2008-05-19 to 2008-08-29, revision: 2009-10-28 to 2009-11-22 and 2009-12-18 to 20. Duration 10 min 10 sec. Commission / occasion Commissioned by the pianist Hans Pålsson (Swe) for his piano students. 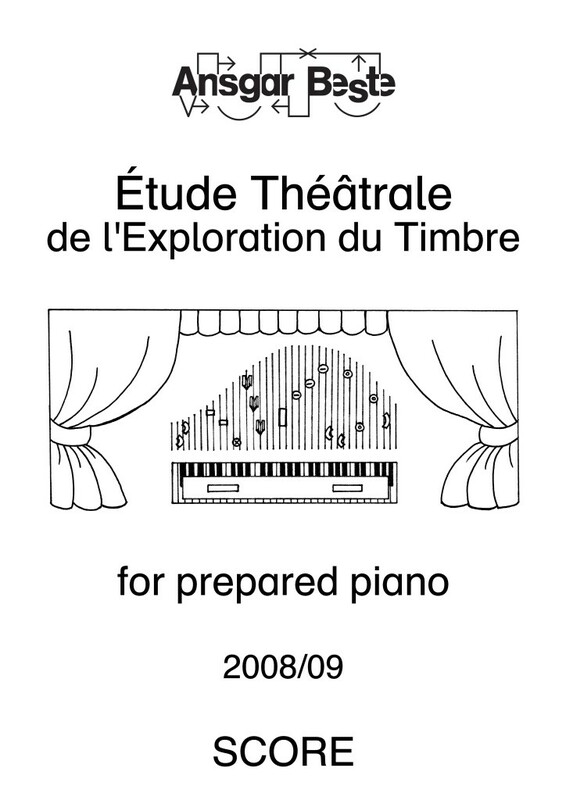 The main idea behind the piece is a systematic exploration of the timbral and theat­ri­c­al potential of extended playing tech­niques on the piano and their fusion into a mu­si­­cal­ly coherent and formally dramatic event. The piece is structured according to Fibonacci numbers and divided into 6 sections, of which the enframing sections (1+6) are played on the keyboard, the adjacent sec­tions (2+5) on the strings and the mid sections (3+4) on the body of the in­stru­ment. Three parameters are formally developed in quite continuous, but different ways: The density of sound production is be­gin­ning on a very low level and gradually increasing in the first three sections, the other way round in the last three ones. The res­­o­nance, sup­port­ed by the sustaining and the sostenuto pedals, proceeds in the opposite direc­­­tion, i. e. decreasing in sections 1-3 and in­creas­ing in sections 4-6. Dynamics, final­ly, run in waves, beginning “sffz” in section 1, then falling to “pp” at the beginning of section 2, ris­ing again to “sffz” at the beginning of section 3 and so on. These op­pos­ing de­ve­lop­ments generate a permanent fluctuation of the perceptive focus and, not least, a slight surprise at every transition point from one section to another. However, there is a clear anticlimax at the golden section between parts 3 and 4, contrasted by two strong theatrical climaxes due to a “total cluster” in the very begin­ning and its recurrence in the very ending. The relatively quick changes of tools of sound production by the pianist refine the timbral rep­er­toire and augment the theatrical ef­fect on the visual perception of the spec­tator. The preparation of the strings focuses on percussive and gonglike sounds free of rat­tling. duration: 1 min 54 sec. duration: 3 min 13 sec.